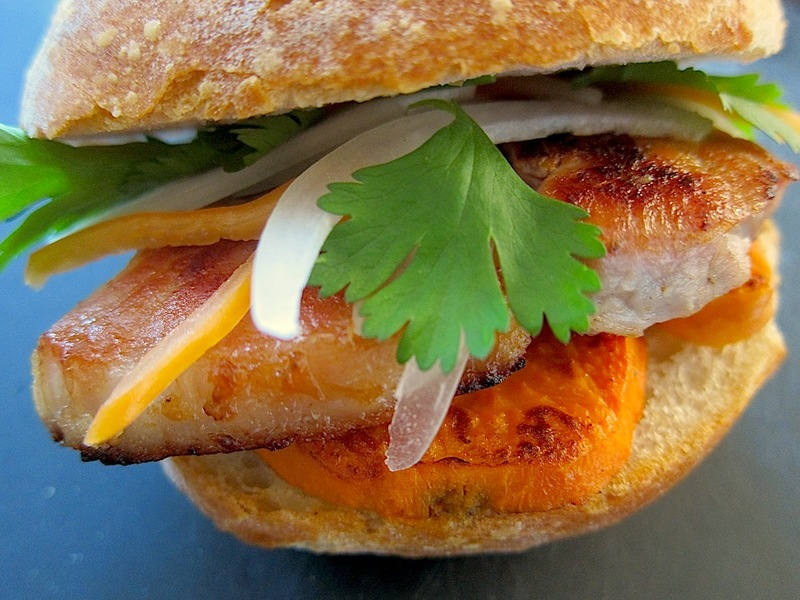 During a recent interview for KQED Bay Area Bites, I was asked about my favorite Peruvian breakfast and without any hesitation my reply was Pan con Chicharron, a braised pork and sweet potato sandwich that is savory, spicy, and goes perfectly with my morning cafe con leche. This is what you need to do to add the Peruvian touch to your next Sunday Brunch. First, you need to plan in advance and let the pork brine overnight. Then you need to braise the pork for about 2 hours. While the pork is braising, you can prepare the sweet potatoes and the salsa criolla, a spicy onion, habanero, and lime juice salsa. Serve the sandwich warm with your morning coffee and you’ll be ready to start your day the Peruvian way.¡Buen Provecho! In addition to the ingredients above, you’ll need a large sealed container for brining the pork, a large pot for braising, a bowl to make the salsa, a pot to cook the sweet potatoes, and a skillet to sear the pork and sweet potatoes. Combine 4 cups water and 1/4 cup salt in a sealable container, add the pork, cover, and brine overnight in the fridge. Remove the pork from the container, discard the brining solution, and place the pork in a large pot. Add enough water to cover the pork by 1 inch, about 10 cups of water. Add 4 onion quarters and the bay leaf, bring to a simmer, partially covered, and let the water reduce completely, about 2 hours. In a separate pot, cook the sweet potato in water until it’s fork tender. Remove from water, peel, cut into 8 rounds, and set aside. Julienne the habanero peppers after removing the stem, seeds, and veins. Julienne the yellow onion, and toss in a bowl with the habanero peppers and juice of 1 lime. Season with salt and pepper to taste. When the braising liquid has completely evaporated, continue to cook the pork in its own fat for a few minutes to brown it. Remove from heat and set aside. Remove the meat from the bone and cut into 4 large pieces. On a skillet with olive oil over medium heat with, brown all the pieces before serving. In the same skillet, brown the sweet potato rounds. Place 2 sweet potato rounds in each bun, topped with a piece of pork, and garnished with the onion and habanero salsa and a few cilantro leaves. Serve warm with cafe con leche. Browning the pork in the skillet is optional and is only necessary if it did not brown enough in its own fat after braising and if you want a crispier texture. Typically, the sweet potatoes are fried but I prefer to cook them in water. That way, they keep better and you don’t have to brown them until you are ready to make the sandwich. You can also warm the sandwich buns in the oven before assembling the sandwich. Instead of braising the pork chop, you can pan fry 4 thin cut pork chops, about 4 oz. each, bones removed. Season with salt and pepper, then pan fry in a skillet with 4 tablespoons cooking oil over medium to high heat, about 3 minutes each side. Turn off heat, add 1 to 2 tablespoon of water to the pan and cover immediately. Let sit for 30 seconds, uncover carefully, and remove pork chops.